The term Achilles tendinopathy entails various debilitating pathologies which can be distinguished in insertional (at the calcaneus-Achilles tendon junction), pre-insertional, and non-insertional (2–6 cm proximal to the calcaneus-Achilles tendon junction). Insertional Achilles tendinopathy is an overuse injury which affects the active population, especially running athletes. 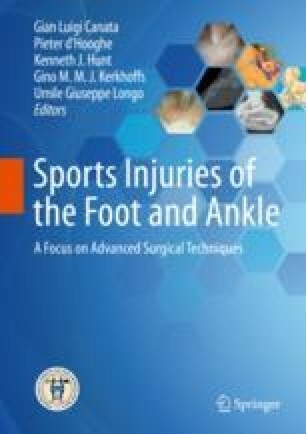 The problem results from repetitive stress to the tendon, but the predisposing factors can be intrinsic (i.e., foot hyperpronation, pes cavus, leg length discrepancy, limited mobility of the subtalar joint, age, obesity, use of steroids and estrogens) or extrinsic (i.e., changes in training pattern, running on not appropriate surfaces). Conservative options including rest or immobilization, stretching exercises, extracorporeal shock wave therapy, the use of non-steroidal anti-inflammatory drugs, and orthotics may provide pain relief. However, surgical treatment is advisable if patients do not respond to conservative management and must address the specific pathology.